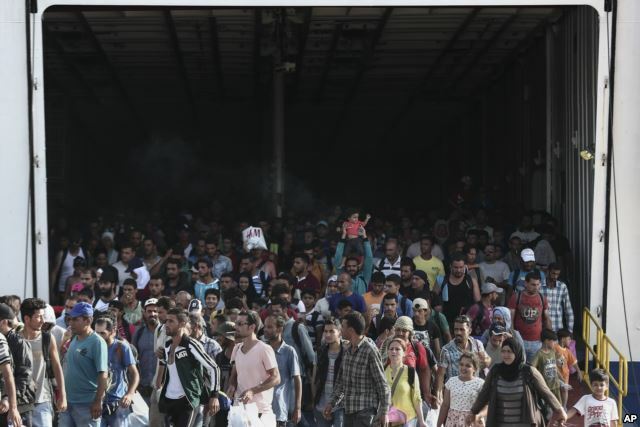 Asylum-seekers depart for the Hungarian border with Austria in Budapest, Hungary, Sept. 6, 2015. 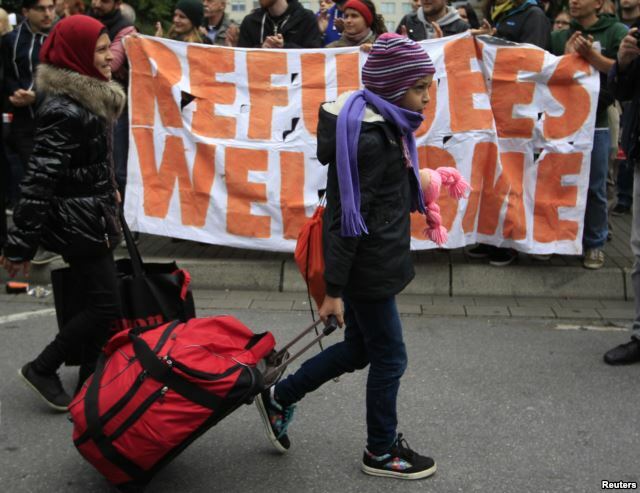 Germany and Austria are welcoming thousands of migrants within their borders Sunday. Most of the migrants have opted to seek refuge in Germany -- Europe's wealthiest country -- where an estimated 8,000 are expected to arrive by day's end. German officials have said they will accept as many as 800,000 asylum seekers this year. The asylum-seekers left Hungary Saturday for western Europe, traveling by bus, train or on foot. 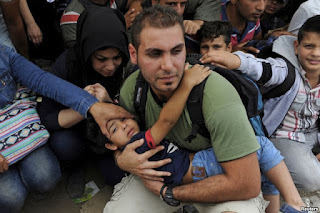 More refugees are passing through Hungary on Sunday. European Union member countries have been divided amid an unprecedented migrant influx. EU foreign affairs chief Federica Mogherini has warned that the migrant inflow is “here to stay” and called for a unifying European approach to effectively respond to it. "It is here to stay, and the sooner we accept it, accept it psychologically and politically, the sooner we will be able to respond in an effective way, and to manage in an effective way," Mogherini said Saturday after a meeting of EU foreign ministers in Luxembourg. "We Europeans, have to keep in mind the history of our continent. We know what it is, war, conflict, and facing a situation that forces (people) to flee," she said. "So we are not talking about immigration and economic migration flow, in majority we are talking about refugees towards which we have a moral and legal duty." Also Sunday, Pope Francis called on every European parish and religious community to take in one migrant family each in a gesture of solidarity, saying he said would start in the tiny Vatican state where he lives. Two parishes in the Vatican will take in a family of refugees each in the coming days, he said. 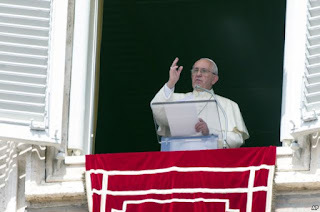 Pope Francis delivers his blessing to faithful during the Angelus noon prayer from his studio window overlooking St. Peter's Square at the Vatican, Sept. 6, 2015. ​"I appeal to the parishes, the religious communities, the monasteries and sanctuaries of all Europe to ... take in one family of refugees," he said after his Sunday address in the Vatican. "Every parish, every religious community, every monastery, every sanctuary of Europe, take in one family." The crowd in St. Peter's Square applauded as the pontiff, himself the grandson of Italian emigrants to Argentina. Also Sunday, Australia Prime Minister Tony Abbott said his country will accept more refugees from camps bordering Syria and Iraq and "is open" to providing more financial assistance, while adding that a "strong security response" was needed for the region. Migrants and refugees disembark from a ferry arriving from the northeastern Greek island of Lesbos, Piraeus, Greece, Sept. 6, 2015. The Australian government is due to make a decision within the week on whether to join airstrikes against Islamic State fighters in Syria, having been part of the operation in Iraq since last year. Immigration Minister Peter Dutton will travel to Geneva to meet with António Guterres, the U.N. High Commissioner for Refugees, to ask what further assistance Australia could provide, Abbott told reporters in Canberra. "We are disposed to take more people from this troubled region," he added. "We are open to providing more financial assistance to the UNHCR." While showing willingness to take more refugees from Syria and Iraq, Abbott refused to say whether the country's overall humanitarian intake, currently set at some 14,000 people, would increase, or the door would be shut on others from elsewhere in the world. A man holds a boy as refugees and migrants wait to cross the borders of Greece with Macedonia, near the village of Idomeni, Sept. 6, 2015. Trains filled with refugees arrived in Austria and Germany Saturday after days of delay at Hungary's Keleti train station in Budapest. The migrants have been welcomed at their destinations in western Europe. 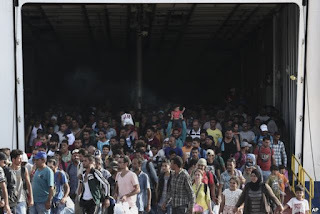 The Associated Press reported that many of the migrants, once they crossed into Austria into a Red Cross shelter, collapsed on the floor with "smiles on their faces," as they were welcomed with food, aid packages and a place to sleep. Back in Budapest, migrants continued to arrive on their journey to the wealthier western European countries. Migrants are welcomed as they arrive at the main railway station in Dortmund, Germany, Sept. 6, 2015. Hungarian officials have consistently placed obstacles in the migrants' trek to western Europe. The migrants are not interested in settling in Hungary, yet Hungary seems set on doing all it can to prohibit them from reaching their destinations in other parts of Europe. Hungary had refused to let the refugees board westward trains, in an effort to comply with European Union regulations that require they be registered in the first EU country they get to. But the refugees refused to go to processing centers, hoping to move on and register somewhere else where the economy is stronger. Hungarian Prime Minister Viktor Orban sees himself as a defender of the continent's Christian heritage. Orban said Saturday, "The supply of immigrants is endless. If everyone is admitted, it will destroy Europe."